Christmas before last I was delivering my tea talk at a London gallery, during which I also was going to present variety of tea from each of the six main Chinese categories, perform the ceremony, and infuse it for the audience to taste. 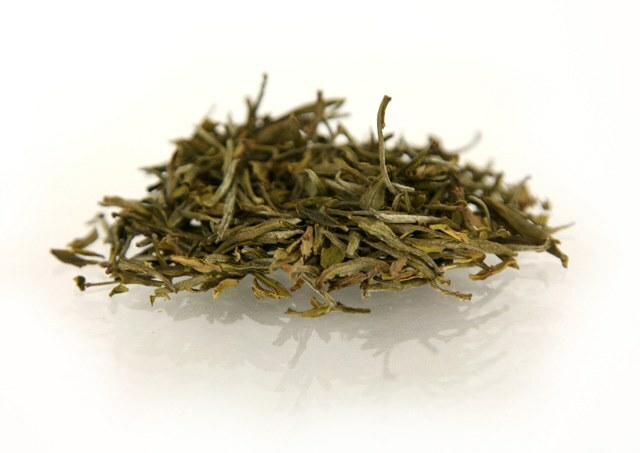 To demonstrate how the leaves can be rolled into shapes that are not only pleasing to the eye but also designed to enhance the aestheticism of the infusion, I needed some Jun Shan Yin Zhen (Silver Needle) yellow tea, a premium variety I could only get from very few suppliers over here. So I bought JING’s Huoshan Yellow Bud as a back up. I got my Yin Zhen in the end, but since then, the Huoshan Yellow Bud has become my favourite yellow tea. True to its name, the tender slim buds are a yellow green, as pleasing to the senses as their piquant leafy scent. Infuse for for 2-3 minutes in water of 70 Celsius, not boiling. The liquid is an elegant light yellow. The aroma of this tea is, what I love most about it. As one drinks, one inhales the aroma of mist and frost. The nectarous taste is mild and round, light at first, but lingers in the palate for a good while. A perfect tea to be enjoyed in a glass set. A treat to be taken slowly and savoured, but keep your infusions refreshed. My favourite time for drinking this is on a Sunday afternoon in the summer. A relatively less known category of tea from China, the leaves of yellow tea are prepared by slight oxidation, “steaming” the still warm leaves after they are dried, under a damp cloth, a process that gives the them their characteristic hue. Drinking the Huoshan Yellow Bud certainly reminds of the beautiful landscape of Anhui, where the tea is grown, with its soil rich in humus and iron that also produces renown green and black tea.